I have a couple of dicentra that I have forgotten the names of - maybe I should buy more. Come to my open day in September and I will give you some - and I won't think you are Zena Lovage this time! An offer I can't refuse and maybe the best one that I have had all day. I have developed feeling stupid (or even stupidm) as an art form. Yes, I can tell that you are crazy about Dicentras. Amazing photos, I especially like 'Bacchanal'. Also the picture of Neil at work. Yes Jason. In view of Sue's comment I can imagine her in the same pose! The fact that the "glossy magazine" would only send their photographer once is just so typical of the media! They want everything to be ready for them, they don't understand that nature does its own thing in its own timescale. I expect that after Neil's efforts they will only use about 3 photos anyway. And the article will be written via a telephone interview! How pretty Dicentra cucullaria is! I have not heard of it before and have promptly put it on my wish-list. I love dicentras and have several ‘Baccanal’ along with some spectabilis - ‘Alba’ and ‘Valentine’ although the latter has not come up yet so I fear he didn’t like being dug up from my previous garden and spend last year in a pot. 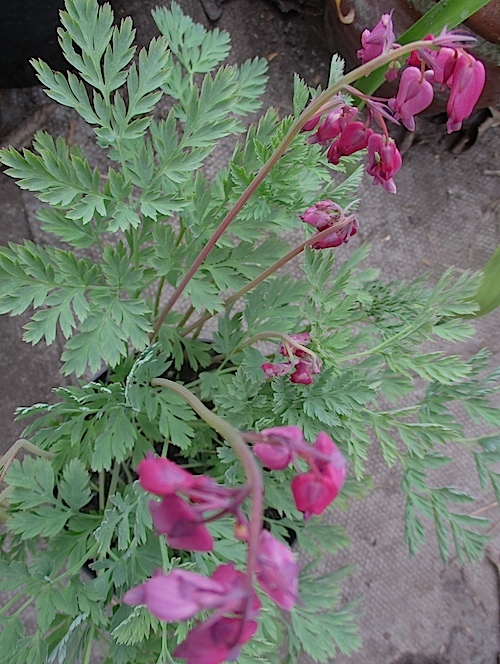 I would love many more dicentras for my woodland bed, but they need to be easy going and not require much fuss :-) I read your post about buying plants from Japan, why do you feel Dicentra peregrine is difficult to grow – more difficult than Baccanal’ for example? I really enjoy your thoughtful comments HELENE. Isn't it a nuisance when your spell checker changes peregrina to peregrine. peregrina is difficult to grow because of severe climate differences with its native Japan. Even there it is only wild at certain altitudes where it is a protected plant. It grows in deep volcanic soil -I suppose you can reproduce this in a suitable alkaline lumpy compost but perhaps not the natural depth. It likes high rainfall but its natural soil is very well drained. It does not like our extremes of temperature or their rapid changeability. It stands loads of cold but not extreme or changing. It is susceptible to very high temperatures. It likes bright conditions but apparently the light intensity is not extreme in fairly cloudy Japan? I am shading with a little fleece when the sun is really strong. My pots are on the shady side of other larger plants in my well ventilated greenhouse. Will I put them outside soon? A good gardener said to me that if he needed to reproduce the complete climate of another country he would not bother! My perigrinas from Japan are doing very well at the moment! Me and my different spell checkers (I write in 3 different languages) are at war at times – but I am afraid the mistake writing peregrine instead of peregrina was all down to me, I don’t use predictive text as that’s hopeless when you are multi-language! I will definitely not have a go at Dicentra peregrina, and I agree with the good gardener of yours – I wouldn’t bother reproducing the complete climate of another country for some plants either. Plants in my garden will need to adapt to the climate and soil I have and what I am able to give of care - or go to some other gardener! Roger, you might want to edit out your email address, or it will get picked up by a spambot. There are ways to try to make it invisible, such as nodiggardener(@gmail.com) (remove brackets) or nodiggardener at gmaildotcom but no guaranteeing that they will work! Thanks for the tip Sarah - think I will risk it!